Quickly – check the calendar. Do you know what time of year it is? That’s right, it’s “spring”. Now, while most of the United States is not experiencing weather that qualifies as “spring weather”, it still says spring on the calendar, so we might as well take advantage of it. And what better than some spring cleaning! And what better to start with then HVAC Spring cleaning? General Air of South Carolina is here to provide you with the ultimate checklist for all your HVAC spring cleaning needs. We will go over what to clean, and how to clean in throughout your home. As well as why it’s important to clean them, and how they can affect your day to day life once they’ve been scrubbed up and ready for the summer. This item on our list is already on most people’s spring cleaning list, but adding it to your HVAC spring cleaning list is just as important. Dusting your house and every nook and cranny can immensely increase your air quality. Picking up dust before it is sucked up by your unit can keep it from being recirculated around the house. Tricky spots such as the ceiling fan, air vents and intake vents, high banisters and chandeliers are prime suspects, as their height keeps them from being in sight at all times, and from being dusted regularly. The reason this is on your HVAC spring cleaning list, and the first on your checklist, is because dusting is important to maintaining the cleanliness of your air filters, and vents. Dusting very dusty items can put the debris in the air, and it is important to let the dirty intake vents collect dust, instead of dirtying a brand-new set of filters and cleaned vents. It is also important to get the dust out of vents on the floor, and under appliances using a vacuum. Give time to let the dust and debris settle, before continuing this checklist. One of the most frequented items on this blog is also a critical part of your HVAC Spring Cleaning list, changing your filters. The reason you wanted to dust first, was so that when you changed your filter it would not be filled with dust again after you had cleaned it from your house. Cleaning and changing these filters can greatly increase your air quality, and reduce your energy costs. A dirty filter can make it harder for air to circulate, as well as recirculate dirt and other contaminants into your home, and often of greater density than they were at before. Do not skip step! It is so small and easy, and has a lasting impact. Some parts of your house are just unreachable. It is a matter of fact that you do not have the equipment or the knowhow to reach every nook in cranny of your HVAC system. That is why it is on your HVAC spring cleaning list to get a professional to clean those hard to reach places in your home. A professional from General Air of Greenville can reach deep in your vents, heaters and compressors, and other areas you might not be able to, or think to reach. This total cleaning is not necessary frequently, but what better time than spring cleaning! Add it to your HVAC spring cleaning checklist and you won’t regret it. This is another chore probably already on your list, but it does help your HVAC unit specifically. How? Well, you need to clean weeds out from around your intake unit outside, as well as any other vents and locations that might be clogged. These weeds can crawl their way into the unit during the summer and cause serious damage, as well as pollute your indoor air. Simply pulling out any weeds around your intake unit can prevent this, but for longer term solutions one might look into a little DIY construction. Placing your HVAC intake unit on a layer of brick can help prevent weeds from growing into the unit, and is a nice touch to your outdoor space. 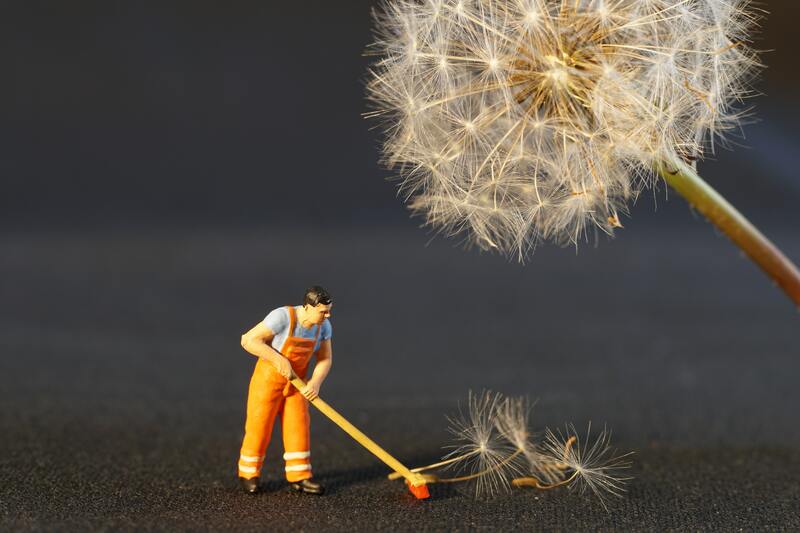 Add weeding to your HVAC spring cleaning list! Another important item that might already be on your checklist is clearing debris from around your house. The reason you want to also add this to your HVAC spring cleaning list is that debris can block your airflow throughout your house, which is going to get more and more important as the weather gets warmer. Debris could be anything by the way, sweeping the house can help, clearing some vents, air filters, and most importantly, clearing the intake unit outside. So, let’s say you cleaning debris and weeds from your outdoor unit, you are done right? Wrong! The unit could have more trapped in it’s blades and fans. It is very important to clear it from anything that could block it, as the more work it does, means the sooner it will break or function less efficiently, and the higher your energy bills will be! So, get a hose and set it to a low spray level (make sure it’s delicate!) and work the water through the unit. This should clear any leaves or dirt that you can not usually reach. Adding this simple and easy task to your HVAC spring cleaning checklist can help maintain your unit, as well as reduce your energy bills! You have it now, so there is no excuse! Play some upbeat music, wait for a sunny day, open your windows and get cleaning! And as always, contact a professional at General Air of Greenville South Carolina for more help, and for any questions.